The light bulb went on! I have a property in Florida that is negatively cash flowing. I also have a skill generating cash by selling stock options. This is a marriage made in heaven! When I started trading stock options, the cash was used to pay for my son’s college education, the purchase of my first investment property, and other family matters. I didn’t like paying taxes on these earnings, but had no choice since I needed the income for immediate use. Once my boys became independent, I only traded options in tax-sheltered accounts so as to defer or eliminate the tax consequences. Enter the sub-prime mortgage crisis. The real estate market has taken a severe downturn the last two years. There is an overabundance of properties available in many markets driving the property value down. There is also a plethora of foreclosures flooding the market further depreciating housing and rental values. Many real estate investors (including yours truly) find ourselves in an uncomfortable negative cash flow situation. One of my investment properties in southwest Florida is costing me $800 out of pocket each month even with an interest-only mortgage. Necessity is the mother of investion. Then it hit me. Why not utilize my ability to generate a monthly cash flow from selling stock options to nullify my losses on this property? My tax concerns are alleviated by the fact that the profits earned by selling options are eradicated by the overall monthly property liability. The door was now open, I stepped in. I picked up a pen and started computing. For years I have been generating returns of 2-4% per month, depending on the type of option I decided to sell. In this particular situation, capital preservation is of utmost importance since I need to maintain my initial investment to generate a continuous monthly cash flow until the housing market turns around. This could go on a long time, unfortunately. I decided to use only in-the-money strike prices in my option sales on stocks that meet only the most stringent of fundamental and technical requirements. Therefore, I need to invest about $27,000 to purchase the appropriate stocks and then sell options on these equities to generate my profit. Those familiar with my system know that by selling only in-the-money strikes, you are, in essence, purchasing an insurance policy to protect your investment. There is some risk in this investment but very limited. It so happened that I had a few mutual fund accounts from years ago that were in hibernation. I liquidated these funds, moved them into my brokerage account and began cashing in on covered calls. Since I activated this idea half way through the current option contract period, this months real estate losses were only cut in half. As of next month, I will be breaking even. Here is an example of how this would work. I will use real life numbers taken from pages 90 and 94 of my book, Cashing in on Covered Calls. Now we start cashing in on covered calls. Sell 1 contract (NY Stock Exchange) of the January $95 call option = $309 profit. Total monthly profit = $948, more than negating the $800 negative cash flow. Conclusion: Investing in stocks, bonds and real estate return results that are cyclical just like the markets themselves. When we are experiencing an unfavorable part of that cycle, acting in a decisive, intelligent, and unemotional manner gives us the best hope to enhance our situation. I offer you one of these approaches. Selling covered call options is the best solution for me. It certainly isn’t the only solution. Evaluate all choices, leave all doors open for evaluation. I wish you all the best of success during these trying times. 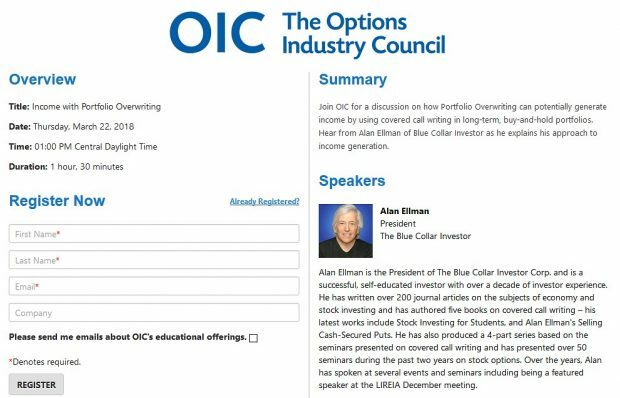 Institutional Investors have been putting money into these industries this past week and that is something we Blue Collar Investors need to know. Use this information in conjunction with all our other system criteria before making your investment decisions. I will be updating this information a few times a month. Check the “comments”link of my most recent journal article periodically for this important data. I also look foward to your comments and suggestions. From a cash flow perspective the idea works well. From a tax perspective, maybe not so much. Depending on your income level you may not be able to utilize all of your losses on real estate (a passive activity). In addition, the gains on option sales are short term, making them subject to your maximum tax rate. Many thanks to Owen Sargent for his perspective on this strategy. I would give serious consideration to his comments and check with your accountant on how this system effects your specific situation. Owen is an outstanding accountant, attorney and long-time stock and option trader. He created the Excel Option Calculator that many of you are utilizing to calculate your great option returns. If any of my readers are in need of a CPA with knowledge of my system and the stock market in general, Owen can be reached at 516-938-3700. I am interested in your exits as I have been burned many times. When a stock is below purchase value ,does it make sense to sell options? Each situation has to be evaluated on its own merit. It does make sense if the equity still meets all our system criteria (fundamentally and technically), has no upcoming earnings report, and will deliver an acceptable 1-month return. In my system, the original cost basis plays no role in this decision. The point is that you have a certain amount of cash in that stock, should it be carried into the financial battlefield in the original vehicle (stock) or another. My upcoming book, to be released in the spring, will really get into detail on this subject. You express some difficulties in the treatment of tax accounting in reporting options to the IRS. May I suggest a program that I have been using for the last three years by the name of TRADE LOG. Reasonable and accurate records, including wash sales. ← RECESSION AND STAGFLATION- How do we respond?